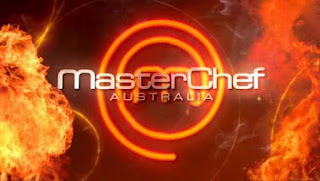 M(i)s Ch(i)ef™: Tomorrow 2012 begins - MasterChefAU 2012 that is! Tomorrow 2012 begins - MasterChefAU 2012 that is! Tomorrow 2012 begins! Well Masterchef 2012 that is. I can't wait! I've been having withdrawals from cooking competitions since MKR finished a few months ago, and have been anticipating the start of MasterChef for weeks now! I have managed to avoid the previews (all but one ad with a couple of hopeful contestants wringing their hands together in a vehicle) so I have no idea what this season will bring! What I hope though is that they bring the Mystery Box and Invention Test combo back and that we see more of the personality of the Chefs and what they can really do. Last season I wished they would show more of what the Chefs cooking style really was. I know Jimmy from two series ago only seemed to cook curry but wow! what curry that was and it was amazing to see all he could do when given a bit of freedom. The contestants last year though seemed to be on a shorter leash with less personality that showed through. I also hope that the Celebrity chef challenge is a weekly feature. How inspiring to see the top Aussie chefs in action with their signature dishes. I am also hoping that I happen across a team challenge some day. Who do you have to know to wangle myself into the pizzeria or sushi bar the Contestants take over for the night? Finally I am looking forward to being inspired to cook some fantastic meals. I love the recipes I have tried from the Masterchef kitchen and can't wait for some pressure test challenging recipes and to see the judges in action in their Masterclasses.